Earlier today, I was sitting on the couch working out some things for a new story when I heard the postal worker jamming the mail in our mailbox (as she usually does). I was surprised to find that among the usual junk mail, there was a sizable package. 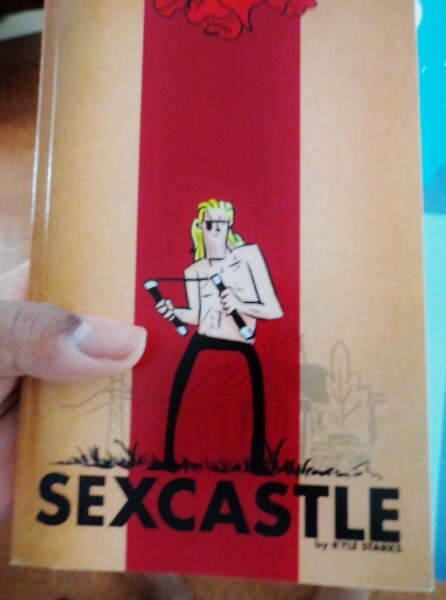 I rushed into the house, grabbed a knife and cut open the package to reveal Sexcastle. I remember backing it on Kickstarter, but I hadn’t heard anything about the book being shipped so I was quite surprised to find it on my doorstep. But after reading it, I’m glad it did. Sexcastle tells the story of Shane Sexcastle, a former assassin who has just been released from prison. Shane has given up his life of violence and starts a new life in a small town. Of course, as is the case with such scenarios, it isn’t long before aspects of his past come back to haunt him and Shane must decide whether or not to return to his killing ways. If that doesn’t grab you, just know there is a character named Thunderbutt. Thunderbutt. I was a great read. Honestly, this was a book I wish I could have written. It’s sharp and keeps the reader interested and entertained. Plus there are enough references to please the 80s action film fans in all of us. I don’t know if there are plans for the book to be mass printed, but I hope so because more people need to read this book. Check Kyle Starks out at: kylestarks.com, twitter, and tumblr.